Stainless steel used for cooking or storage of food and drinks can be a source of metal exposure to sensitive individuals. The high Cr content inhibits oxidation by forming a very thin, transparent layer of chromium (III) oxide (Cr2O3) when exposed to air (passivation). If the metal is stressed — bent, dinged or scratched — metal ions can shed before the passivation layer reforms. 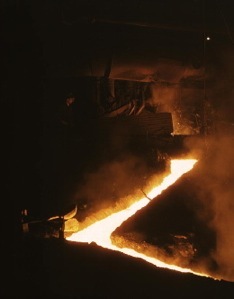 The high Ni content creates a crystalline (austenitic) structure throughout the iron (Fe) which helps it be less brittle at lower temperatures. 304LN actually contains less carbon (C) than all of the other austenite formulations, meaning it is less suitable for heat treatment to increase hardness and strength for uses such as cutlery, tools, etc. The high Ni provides sufficient durability to the alloy for most general purposes, though. 'Chemical passivation' basically removes free Fe particles from the stainless steel surface that are leftover from production and machining. Generally this is accomplished by using an acid wash. After the acid is rinsed away the surface develops a uniform passivation layer that offers better protection against corrosion than one which was "microscopically bumpy". Between electropolishing and chemical passivation, the stainless steel surface can be made very smooth and resistant to oxidation (oxygen working its way into the alloy). Consequently the alloy is also highly resistant to leaching (metal transfer out of the alloy). When products like Klean Kanteen are brand new and without defect they do a good job. Unfortunately, for various reasons even the best stainless steel becomes susceptible to abrasion and other stresses. This can happen through exposure to daily use and cleaning, through accidental handling, etc. 304LN happens to be one of the grades that is most susceptible to chlorine-induced stress corrosion cracking. Also, it has recently been discovered that bacteria cause corrosion because of the acids they excrete. This is known as microbiologically induced corrosion (MIC). This study examined home cookware by atomic absorption spectroscopy. Fe, Cr, and Ni are released by stainless steel because it is readily attacked by organic acids, particularly at cooking temperatures. Once the integrity of the surface is compromised, the rate of corrosion tends to accelerate. Also, it is impossible to predict when, or how quickly, a given piece of stainless steel will begin releasing Ni or Fe. Ceramic and porcelain enamel, on the other hand, simply don't have metal ions to donate (provided, for instance, that the ceramic is not like older varieties that used lead, cobalt, or cadmium for coloring). Porcelain enamel is a specially formulated, highly durable glass that permanently fuses to metal when baked at extremely high temperatures. So, for example, the interior of a SIGG bottle will not crack or flake off. If the bottle is dented, the interior surface simply flexes. Unlike the passivation layer on stainless steel, the baked-on lining can flex with the metal substrate, resist abrasion and acids, and provide the reactively inert surface desired. Ceramic and porcelain enamel have an edge over stainless steel when trying to eliminate sources of metal intake. How much of an edge is difficult to precisely quantify, but certainly over time the benefit increases.